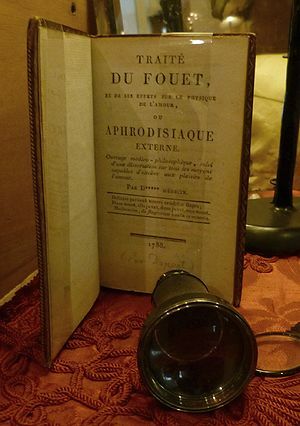 Aphrodisiaque externe ou Traité du fouet et de ses effets sur le physique et l'amour is a medico-philosophical treatise on the erogenous effects of whipping, first published in Paris in 1788. It is attributed to François Amédée Doppet (1753-1799), a physician and writer who later became a general in the French army. The book appeared in German translation as Das Geißeln und seine Einwirkung auf den Geschlechtstrieb, oder das äußerliche Aphrodisiacum. An English translation was published under the title Castigation and its effect on the sexual instinct. The book, in French, was reissued in November 2004 under ISBN 2-915114-08-0.